Early settlers must have found Winsham a very attractive site - a valley slope facing south and sheltered from the north by a high ridge (Windwhistle), with a river for water and fishing. There would have been thick woods with plenty of game for hunting: bear, deer, beaver, lynx, otter, hare (but no rabbits then) and numerous birds. In other words, a comfortable place with plenty to eat. Proximity to the sea was an advantage, for even in early times there was trading of hides, metals and pottery. We have no evidence of Winsham itself being inhabited at any time before the Saxon period, but our knowledge of events in the south west taken from Roman historians, from the Anglo-Saxon Chronicle (a yearly record kept by monks) and other primary sources, enables us to speculate soundly about what life must have been like here. As the Celtic tribes expanded westwards across Europe, driving out or absorbing indigenous people, they began to farm. They cleared trees for long-term settlement and enclosed fields, to reduce reliance on hunting, and planted crops. Some small fields in Somerset and Dorset have the same boundaries today. Many of our familiar wild plants provided food and were used in healing. Nettles, for example, can be woven into a textile as well as eaten, though clothing was mainly plaid-style woven wool, dyed with plants such as madder. 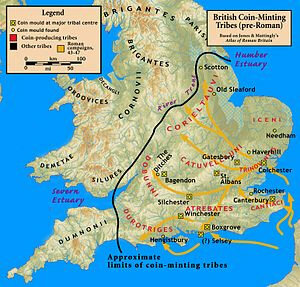 The Romans had their eyes on Britain for some time, as a source of tin, copper, silver, hunting dogs and slaves. When Claudius wanted to add lustre to his reign he sent his commander Vespasian (later Emperor himself) to conquer it. They landed in 43 A.D. and within a year had reached Maiden Castle, where they heavily defeated the local tribesmen. This is near enough for people living here to be aware of the powerful enemy approaching them. Whether they were Durotriges (of Dorset) or Dumnonii(of Devon) they must have seen the well-equipped and highly-disciplined troops, with their red tunics and glittering bronze armour, marching west to establish the fort at Isca (Exeter). The tribes frequently took refuge at one of many nearby hill-forts such as Lewesden, Waddon and Pilsden. As the Romans established control, the people of that Winsham must have been aware of the building of the great road, the Fosse Way, that linked Isca with Lindinis (Ilchester) and Aquae Sulis (Bath), and runs past present day Street Farm (hence its name). As the Roman occupation became more peaceful and permanent, huge villas were built, and local people would have worked for these landowners as farm workers, as slaves stoking the hypocausts, or even, if they learned Latin, as administrators. Many women became "wives" of the army veterans who were granted land after 25 years' army service. After the recent (2001) finding of a previously unknown villa at Lopen, with its beautiful mosaic pavement, and the already recorded villas at Whitestaunton, Wadeford and South Chard, who knows what treasures are still hidden underground? Simply ploughing a field or excavating for a new building can lead to amazing discoveries. When the Roman armies were withdrawn at the beginning of the fifth century, the way was open for another invasion: in this part of the country by the Saxons. They were resisted by local warlords who had been raised in a Romano-British culture; some saw themselves as champions of Christianity against Saxon paganism. The origins of the King Arthur legend come from this time (much embroidered in later centuries) though, despite the claims of Tintagel, Cadbury and Glastonbury, no-one has proved that such an individual ever existed. What we do know is that the Saxons eventually made their homes here and built a settlement. Winsham is a Saxon name, meaning the holding or homestead of some one called Wine. The local pronunciation of the village's name ("winsome") is therefore more accurate than the commoner "win-sham". There was a Saxon church, though unfortunately none of it remains. How Christianity reached Somerset is unknown: traditionally the era began with the arrival of St. Augustine in Canterbury (597 A.D.) sent by Pope Gregory, but the Celtic church is much older. Our nearness to Cornwall, Wales and Ireland, makes it possible that Celtic Christian influences came long before. Of course, if the legend of Joseph of Arimathea planting the Glastonbury Thorn is to be believed, then it was heard of even before that! Stories apart, Saxon society was established and continued until the Norman Conquest over five hundred years later. It was a severely structured society, with the thegns (thanes) who were the large landowners, at the top, and the ceorls (churls) at the bottom. Everyone knew their place within the hierarchy, whether they only tilled their small patch of land among the common fields, and did two or three days work-service a week for their overlord, or whether they were craftsmen in the village: smiths, wainwrights (wagon-makers), potters, for example. The origin of so many modern surnames is obvious. A higher position might be that of the miller, or of the reeve (the village's chosen spokesman). Justice was administered by the "hundred" courts, in a complicated system of fines, such as the wergild (price of a man) in cases of murder, and of trial by ordeal, where God gave the verdict through water or the healing of wounds. Barbaric perhaps, but accepted. 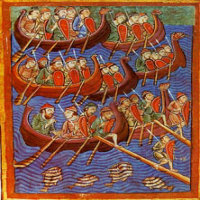 By the end of the eighth century, a new threat arrived: Viking incursions. Originally the Vikings were looters and raiders, carrying off cattle, slaves and anything else valuable. We have no evidence that they ever came this far inland, but news of their raids must have instilled fear all over the country. 875 A.D. Here Ealdorman Eanwulf with the Somerset men, and Ealdorman Osric with the Dorset men, fought against the raiding-army at the mouth of the Parrett. (Burnham-on-Sea). 876 A.D. Here the raiding-army stole away from the West-Saxons into Wareham, and then from Wareham to Exeter. They met a great storm at sea, and 120 ships were lost at Swanage. The Saxons of Winsham cannot have been unaware, or unafraid, of such events, even if they heard of them weeks later. Uncertainty and rumour would have made things worse. By this time, of course, King Alfred was marshalling opposition in this part of the world. Elsewhere the Vikings (or Danes) had begun to seize land and settle down, not just raiding in the summer. After some failures in battle, Alfred withdrew to Athelney to shelter and recoup his forces. Athelney (on the present A361 near Burrowbridge) is less than twenty miles from Winsham: is it possible that men from Winsham were sent to join his war-band? A difficult journey across the undrained marshes of Sedgemoor, but some may have thought it worthwhile. By the year 1000, Danish kings ruled most of England, but in the southwest loyalty was still to the Cerdingas, the descendants of King Cerdic. These died out with Edward the Confessor, and the struggle for the throne began. Were people here aware of Harold Godwinson's ambition to be king? He rode to Bristol to cross the Irish Sea to ask for Danish help, fighting the battle of Porlock on the way back. But we all know what happened to him at Hastings in October 1066, and the rest, as they say, is history. Copyright � Winsham Web Museum. All rights reserved.